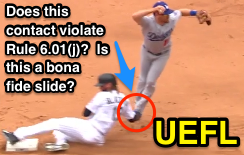 Runner intent is a key component of MLB's bona fide slide interference rule, which made its first appearance of the 2017 season by way of Replay Review during Friday's Dodgers-Rockies game. 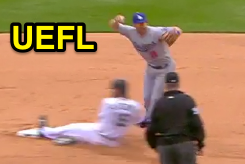 The Play: With none out and two on (R1, R2) in the bottom of the 5th inning, Rockies batter DJ LeMahieu hit a 1-0 changeup from Dodgers pitcher Hyun-Jin Ryu on the ground to third baseman Justin Turner, who threw to second baseman Logan Forsythe as Rockies baserunner R1 Charlie Blackmon slid into second base. U2 Cederstrom observes Blackmon's slide. After 2B Umpire Gary Cederstrom ruled Blackmon out (and nothing further) on the force play, Dodgers Manager Dave Roberts filed a Manager's Challenge alleging Blackmon's slide violated sophomore slide rule 6.01(j), which states, "If a runner does not engage in a bona fide slide, and initiates (or attempts to make) contact with the fielder for the purpose of breaking up a double play, he should be called for interference under this Rule 6.01." After observing replays indicating contact between Blackmon's right hand and Forsythe's left foot, Dodgers color commentator Orel Hershiser opined, "That would be slightly ticky-tac." Analysis: As a matter of bookkeeping, it is important to make the distinction between pre-2016 interference 6.01(a)(5) and aforementioned bona fide slide rule interference 6.01(j). The reason for this technical distinction is that 6.01(a)(5) is not reviewable via Replay Review, while 6.01(j) is subject to video review, though as we'll discuss in a moment, it doesn't much matter. OBR 6.01(a)(6), by the way, states, "If, in the judgment of the umpire, a base runner willfully and deliberately interferes with a batted ball or a fielder in the act of fielding a batted ball with the obvious intent to break up a double play, the ball is dead. The umpire shall call the runner out for interference and also call out the batter-runner because of the action of his teammate. In no event may bases be run or runs scored because of such action by a runner." Even though "willful and deliberate" interference [6.01(a)(6)] is not reviewable, that fact is rather superfluous. The standard for declaring an extra out for violation of the bona fide slide rule is less than it is for "willful and deliberate" interference. 4) Slides within reach without changing his path for the purpose of initiating contact with a fielder - ?. Upon review, this slide was deemed illegal. And as we wrote back then, "As has been interpretation in years past, the intent of the runner may be cause alone for an interference ruling. For instance, a runner may satisfy the new bona fide slide criteria, but if the umpire rules the runner intentionally attempted to initiate contact with the fielder, then double play interference may be called." Rule 6.01(j) continues, "A slide shall not be a 'bona fide slide' if a runner engages in a 'roll block,' or intentionally initiates (or attempts to initiate) contact with the fielder by elevating and kicking his leg above the fielder’s knee or throwing his arm or his upper body." Crew Chief Cederstrom announces the call. Thus, it is apparent that in electing to overturn Cederstrom's call, the Replay Official deemed that Blackmon's actions constituted "throwing his arm or his upper body" and that Blackmon intentionally initiated contact with Forsythe for the purpose of breaking up a double play, the penalty for which is interference under Rule 6.01. 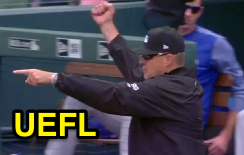 In accordance with the penalty for interference, Rockies baserunner R2 Kyle Freeland was returned to second base and, with two out, did not score; Dodgers first baseman Scott Van Slyke was credited with the second put-out on batter-runner LeMahieu. In the end, it made little difference, as Colorado won the game, 2-1. Video available via "Read more"